Get must-know info about doorless showers—including size, material, and cost considerations—to find out if one will work in your bathroom. 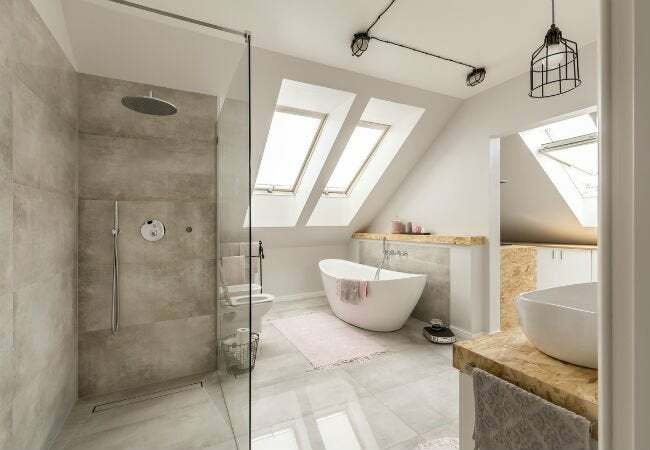 If a bathroom makeover is at the top of your bucket list, and you’ve been poring over design websites for inspiration, you’ve no doubt seen those chic doorless showers that are so desirable right now. Creating a spacious feel—plus the bonus of no door to scrub—these walk-in wonders have loads of style, but they’re not for everyone. Read on for a full understanding of these trendy bath treatments, plus design and construction tips sure to help if you do decide to ditch that door. Sixty years ago, bathrooms were modest affairs; a tub, a commode, a vanity, and perhaps a linen cabinet, all squeezed into a conservative five-foot by eight-foot space. In the ‘70s, homeowners began to add second (or third) bathrooms to their homes, and in the ‘80s, remodeling to include a master bathroom became the rage. As the trend for larger homes continued into the new century, master suites appeared, complete with oversized bedrooms, sizeable walk-in closets, large luxurious bathrooms, and stunning doorless showers. At first, the showers were limited to high-end homes, but builders and architects were soon including them for mid-range construction as well. Before getting rid of that dated tub-and-shower combo in favor of a doorless shower, understand the benefits and downsides to these fashionable fixtures. + Glass shower doors require constant cleaning to avoid hard water spots, so a doorless shower means one less thing to clean. + No step-over curb at the entrance makes the shower easily accessible to the elderly and those with mobility issues. Doorless showers are standard in age-in-place universal design. 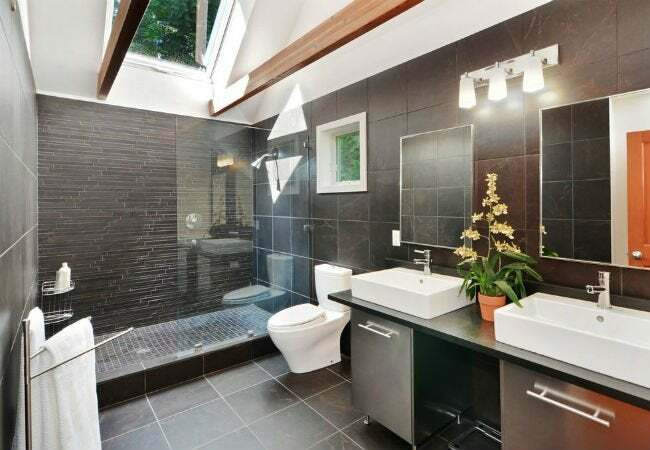 + With no glass door to interrupt traffic flow, the bathroom feels more open and roomy. + Doorless showers are custom designed to fit your space and style. You can choose, for instance, the number and placement of niches to hold toiletries like shampoo; you can also have a shower seat installed. – Doorless showers require more floor space than a standard tub or shower stall, making them unsuitable for small bathrooms. – With no door to trap in steam, doorless showers have a tendency to feel drafty at times. Draftiness can be reduced through the installation of infrared heating lights, towel warmers, and heated flooring. – There’s a lot less privacy than a closed shower. – Replacing the sole bathtub in your home could lower your house value. For resell purposes, a house should have a least one tub. – Doorless showers are pricey because they’re custom designed. Whereas having a standard tub or shower professionally installed runs an average of $1,200 to $3,000, a custom doorless shower installed can easily cost upwards of $5,000, depending on size and materials. – Putting in a doorless shower isn’t a do-it-yourself kind of project. Grading the floor, installing drains and plumbing, and building and tiling walls are jobs best left to the pros. In many cases, installing a doorless shower will require a permit and periodic inspections by the local building authority. A doorless shower should be both functional and aesthetically pleasing. The following design tips will help you and your contractor stay on the same page. • Size matters with doorless showers. Local building codes may specify that a shower stall must be a minimum of 36 inches by 36 inches, but doorless showers, out of the need to keep water from spraying the rest of the bathroom, require additional space. Figure on adding at least an additional 24 inches of entryway; most walk-in showers are at least four feet wide by five deep, and many are much larger. • Position the shower in the corner of the bathroom for the best space usage. Due to their large size, doorless showers can look out of place along the center of a wall. 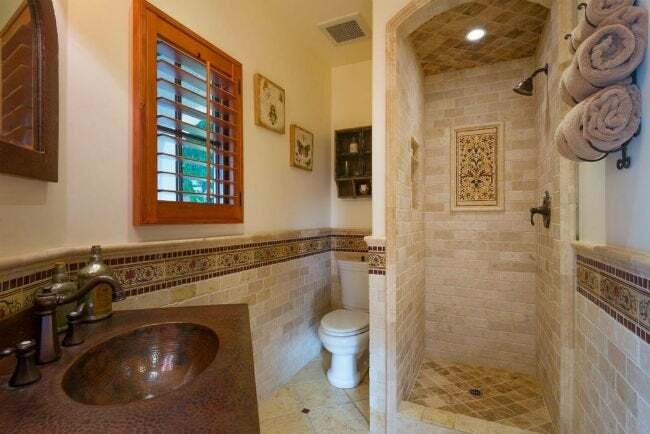 • Plan to have at least six feet of open space adjacent to the entrance of the shower. This is the “splash zone” and anything you position within this area is likely to get wet at some point. • Consider multiple drains. In a doorless shower, the floor is graded gently toward a drain, but installing an additional drain or two further reduces the risk of water running out on the bathroom floor. • Opt for a rainfall showerhead. This option keeps vigorous spray from bouncing off the shower walls (or you) and ending up on the floor outside. If going with a traditional showerhead, position it so that the spray is directed away from the shower entrance. • Use only waterproof lights and fixtures within spray distance of the showerhead. • Plan to make the shower a minimum of five feet by five feet for mobility purposes (i.e., a wheeled shower chair), which will allow a shower chair, plus enough room for an aide to assist. • Choose non-slippery flooring. Any sort of glazed tile is unsuitable due to the risk of slipping and falling. Only matte flooring, such as unglazed travertine, slate, or limestone should be installed. In many doorless showers, the tile used for the flooring is also used for the shower walls and sometimes even the rest of the bathroom floor and walls. • Overlapping short walls at the entrance will help keep water inside where it belongs. One popular design is to create an entrance where you have to walk around a short wall on one side and then another short wall on the other side to enter the shower. This adds a modicum of privacy as well as containing shower spray—but you must have enough space to build it. You’ll need an additional four to six feet. • Go with glass if your bathroom is on the small side. While many doorless showers feature tiled walls, a single glass wall will provide a feeling of openness in a small bathroom. Constructing shower walls from glass blocks will let light into the shower while still affording a measure of privacy. • Install a good ventilation fan. While showering is a steamy prospect in any bathroom, showers with doors block more of the moisture, allowing it to condense on the shower walls and drain away. Doorless showers permit more steam to escape, so you’ll need a ventilation fan to remove excess humidity, which can increase the risk of mold growth.